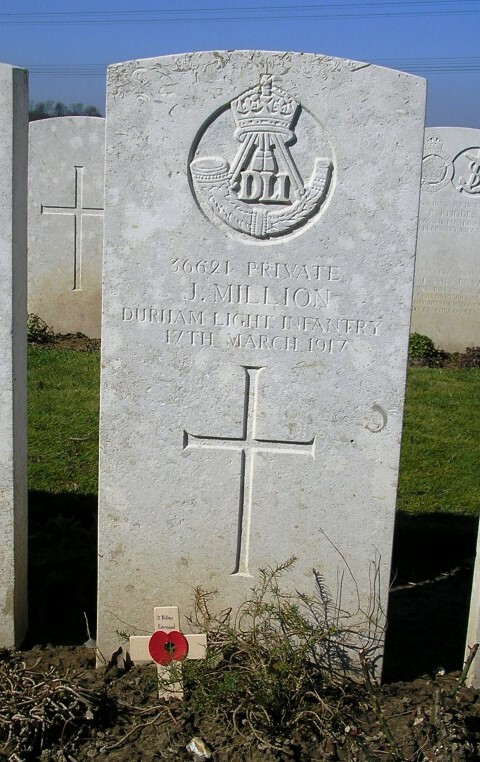 36621 Private Joseph Million, 18th Battalion, Durham Light Infantry died of pneumonia 17 March 1917 and is buried in Varennes Military Cemetery, France. He was 27 years old and is commemorated on Evenwood War Memorial and the Roll of Honour, St. Paul’s Church, Evenwood. In 1901 the Million families was resident of Evenwood and 51 year old Richard worked as a coal miner (hewer) and 16 year old John was a coal miner (driver). In 1901 neighbours’ of the Million family were Simpson and Alice Maugham whose second son was 12 year old John who was 26952 Private J. W. Maugham 12/DLI who died of pneumonia 27 January 1919 and is buried in Evenwood cemetery. John Million attested at Bishop Auckland 22 February 1916 when 25 years and 5 months joining the Durham Light Infantry and being given the regimental number 36621. He was probably placed to the Army Reserve. Private J. Million embarked for France 20 February 1917 being posted to 11/DLI 20 February 1917 then reposted to 18/DLI 11 March 1917. Private Joseph Million would have been a draft required to reinforce the battalion due to losses during the Somme offensive. He was not involved in the campaign. The Battle of the Somme may have been abandoned but trench warfare continued unabated. 26 February: 18/DLI ordered to take German first and second line trenches near Nameless Farm. 27 February: further ground gained, entered Gommercourt and established posts. 1 March: attacked up Ron Graben trench – water-logged, little progress. Stokes guns clogged up with mud. 3 March: attack on First Garde Stellung successful – casualties 15 killed, 28 wounded and 8 missing. Several officers and men decorated later for this action. 18 March: at night, relieved and withdrew to Rossignol Farm. After a rest, they worked on the broad gauge railway from Colincamps to Serre then moved onto Bethune. Private J. Million landed in France 20 February 1917 and 11 March joined the 18/DLI. Within 25 days of landing in France, he had died from “Lobar Pneumonia” 17 March 1917 in XI Casualty Clearing Station. The Medical Case Sheet provides a report. Private Joseph Million was admitted with breathlessness and right sided chest pain. He was also found to have bronchial breathing. These are classical signs of a lung infection. Unfortunately, due to the lack of antibiotics he succumbed to the infection. It appears from the report that shortly after admission he became cyanosed (turned blue due to lack of oxygen from lung failure) and died shortly after. Clearly the infection must have been quite severe and advanced for this to have happened. A poor immune system due to malnourishment would have contributed to this sad demise. The report gives a time of death as 10.30am but it is not clear how long he had been in hospital. It also states that the infection is as a result of exposure. However, the last words of the report cannot be deciphered. Private J. Million was awarded the British War and Victory medals. A pension was awarded to Ellen for herself and one child took effect from 15 October 1917. The commemorative plaque and scroll was forwarded to Mary Ellen some time later. In late 1918, Ellen Mary Million married and was now called Mrs. Jepson  and lived at Mill Wynd, Staindrop. Private J. Million is buried at grave reference I.J.39 Varennes Military Cemetery. Varennes is a village located between Albert and Amiens, in the region of Somme, France. The cemetery was laid out by the 39th Casualty Clearing Station in August 1916 following the Battle of the Somme. It was then used by the 4th, 11th and 47th Casualty Clearing Stations. There are 1,219 burials.